Today, the development of new and well-tolerated anti-malarial drugs is strongly justified by the emergence of Plasmodium falciparum resistance. In 2014–2015, a phase 2b clinical study was conducted to evaluate the efficacy of a single oral dose of Artefenomel (OZ439)–piperaquine (PPQ) in Asian and African patients presenting with uncomplicated falciparum malaria. Blood samples collected before treatment offered the opportunity to investigate the proportion of multidrug resistant parasite genotypes, including P. falciparum kelch13 mutations and copy number variation of both P. falciparum plasmepsin 2 (Pfpm2) and P. falciparum multidrug resistance 1 (Pfmdr1) genes. Validated kelch13 resistance mutations including C580Y, I543T, P553L and V568G were only detected in parasites from Vietnamese patients. In Africa, isolates with multiple copies of the Pfmdr1 gene were shown to be more frequent than previously reported (21.1%, range from 12.4% in Burkina Faso to 27.4% in Uganda). More strikingly, high proportions of isolates with multiple copies of the Pfpm2 gene, associated with piperaquine (PPQ) resistance, were frequently observed in the African sites, especially in Burkina Faso and Uganda (> 30%). These findings were considered to sharply contrast with the recent description of increased sensitivity to PPQ of Ugandan parasite isolates. This emphasizes the necessity to investigate in vitro susceptibility profiles to PPQ of African isolates with multiple copies of the Pfpm2 gene and estimate the risk of development of PPQ resistance in Africa. Emergence of Plasmodium falciparum resistance to anti-malarial drugs is currently the primary rationale supporting the development of new and well-tolerated drugs. While the estimated number of malaria cases in the world decreased from 237 million (218–278 million) in 2010, to 211 million (192–257 million) in 2015, the morbidity and the mortality have stabilized in 2016 with estimates of 216 million cases (196–263 million) and 445,000 deaths (compared to 446,000 in 2015) as reported by the World Health Organization (WHO) [1, 2, 3]. Globally, the vast majority of deaths (> 90%) caused by malaria is due to P. falciparum infections, occurring in Africa, in children under 5 years of age. Artemisinin-based combination therapy (ACT) which are currently recommended as first-line treatment of uncomplicated falciparum malaria, is less effective in Southeast Asia, particularly in Cambodia, where high rates of treatment failure associated with artemisinin and piperaquine resistance are currently reported [4, 5, 6, 7, 8, 9, 10, 11, 12, 13, 14, 15, 16]. The containment and the elimination of these multidrug resistant parasites in Southeast Asia are a priority for the WHO to avoid their spread to Africa as was the case with previous generations of anti-malarial drugs (e.g. chloroquine, sulfadoxine–pyrimethamine) . Fortunately, molecular markers associated with such resistance are available . In particular, mutations in the propeller domain of a kelch gene located on the chromosome 13 (kelch13), and amplification of a cluster of genes encoding both plasmepsin 2 (Pfpm2) and plasmepsin 3 proteins, have been recently shown to be associated with artemisinin and PPQ resistance, respectively [18, 19, 20]. According to the latest WHO update on artemisinin resistance , to be validated a kelch13 resistance mutant has to be correlated with delayed parasite clearance in clinical studies and reduced drug in vitro susceptibility with survival rate ≥ 1% expressed by the Ring-stage Survival Assay, (RSA0–3 h) in fresh isolates (ex vivo assays), or culture-adapted field parasites or kelch13 genome-edited parasites (in vitro assays) [22, 23, 24, 25]. To date, only nine kelch13 mutations have been shown to be validated (C580Y, Y493H, R539T, I543T, N458Y, P533L, M476I, R561H and F446I). The F446I mutant is highly prevalent in Myanmar as recently reported . In Africa, a broad array of rare non-synonymous mutations in the kelch13 gene have been described in P. falciparum isolates, but none of these mutants have been associated with artemisinin resistance , attesting that not all non-synonymous kelch13 mutations confer resistance to artemisinin. More recently, resistance to PPQ has been associated with an increase of survival rates of parasite exposed to 200 nM PPQ for 48 h in the piperaquine survival assay (PSA) and with the amplification of plasmepsin 2–3 genes (Pfpm2–3) [6, 20]. In Cambodia, where high rates of treatment failure to dihydroartemisinin–piperaquine (DHA–PPQ) are observed (i.e. > 60% in some provinces), it has been demonstrated that amplification of Pfpm2 gene and presence of validated kelch13 mutations were highly predictive of DHA–PPQ treatment failure . Most of these parasites harbour a single copy of Pfmdr1 gene leading to the recovery of mefloquine sensitivity [4, 6] and suggesting a natural antagonism between PPQ resistance and mefloquine resistance. However, so far it was not understood whether Pfmdr1 de-amplification (from multiple copies to single copy Pfmdr1) was due to the implementation of DHA–PPQ as first-line treatment or due to the release of mefloquine pressure and an increase in parasite fitness accompanying Pfmdr1 gene de-amplification. To date, DHA–PPQ resistance was confined to Southeast Asia. So far, only few studies conducted on parasites from Mozambique and Mali have provided evidence of the presence (at low frequency, 1.1%, 10%) of parasites carrying multiple copies of Pfpm2 [28, 29]. Facing the threat of losing all current artemisinin-based combinations front-line therapies due to resistance, a new generation of endoperoxides with more favourable pharmacokinetic profiles like the ozonide Artefenomel® (OZ439) have been developed . 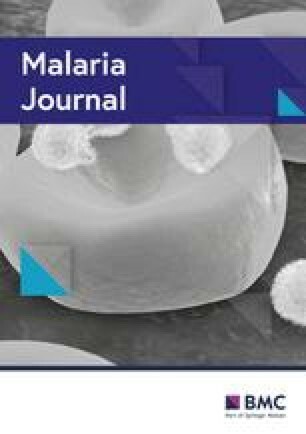 The efficacy of this new chemical entity was evaluated in combination with PPQ in African and Southeast Asian (Vietnam) patients with uncomplicated falciparum malaria infection . The primary objective of this phase 2b clinical study was to determine whether a single oral dose combination of artefenomel/PPQ was efficacious and safe [≥ 95% of patients cured on the basis of polymerase chain reaction (PCR)-adjusted adequate clinical parasitological response at day 28 (ACPR28)] in adults and children infected by P. falciparum. Blood samples collected in 2014–2015 from this clinical trial offered the opportunity to investigate the proportion of multidrug resistant parasites (i.e. P. falciparum kelch13 mutants and gene copy number of both Pfpm2 and Pfmdr1). Here, the occurrence of such genotypes from these samples is reported and a map of potential risk of emergence of resistance to the main front-line therapies currently used to treat malaria-infected patients and to the next generation of anti-malarial combinations is provided. The study was a randomized, double-blind, single-dose design to investigate the efficacy, safety, tolerability and pharmacokinetics of artefenomel 800 mg in loose combination with three doses of PPQ phosphate (640 mg, 960 mg, 1440 mg) in male and female patients aged ≥ 6 months to < 70 years, with uncomplicated falciparum malaria in Africa and Southeast Asia (Vietnam), as previously described . This study was conducted in 13 sites, including Burkina Faso (three sites, N = 127), Uganda (one site, N = 124), Benin (one site, N = 1), the Democratic Republic of Congo (one site, N = 5), Gabon (two sites, N = 94), Mozambique (one site, N = 14), and Vietnam (four sites, N = 83). A total of 448 patients were randomized into each of three treatment arms: artefenomel 800 mg/PPQ 640 mg (N = 148), artefenomel 800 mg/PPQ 960 mg (N = 151) and artefenomel 800 mg/PPQ 1440 mg (N = 149). Patients presenting P. falciparum mono-infection confirmed by microscopy to be in the range of 1000 to 100,000 asexual parasites/μL of blood, and with fever (axillary temperature ≥ 37.5 °C) or reported fever episodes in the preceding 24 h, were included in the study after having submitted their written informed consent/assent. The following important exclusion criteria were considered: presence of severe malaria (WHO definition), haemoglobin below 8 g/dL, known history or evidence of clinically significant cardiac disorder, including QTcF or QTc B > 450 ms, or family history of sudden death or clinical conditions known to prolong QTc, clinically significant hepatic dysfunction and prior anti-malarial treatment within a specified time windows. After the drugs administration, patients were followed for 42 days or 63 days at some centres. Patients remained in the clinical unit for a minimum of 48 h (African patients > 5 years old) or 72 h (African patients ≤ 5 years old and all Asian patients) and were discharged on the basis of absence of detectable parasites and fever. Plasmodium falciparum DNA was extracted from dried blood spots using the QIAamp DNA Mini kit (Qiagen, Germany), according to the manufacturer’s instructions. Samples were screened to confirm the presence of P. falciparum DNA using first a qualitative real-time PCR assay targeting the Plasmodium cytochrome b gene and secondly on positive samples, four real-time PCR assays specifically amplifying P. falciparum, Plasmodium vivax, Plasmodium ovale and Plasmodium malariae . Plasmodium falciparum positive samples were tested for the presence of mutations in the propeller domain of the kelch13 gene (PF3D7_1343700) that have been associated with artemisinin resistance . Amplification of the Kelch-propeller domain (codons 440–680, 720 bp) was performed as previously described . Cross-contamination was evaluated by adding no template samples (dried blood spots negative for P. falciparum) in each PCR run. PCR products were sequenced by Macrogen (Seoul, Korea). Electropherograms were analysed on both strands, using PF3D7_1343700 as the reference sequence. The quality of the procedure was assessed by including dried blood spots with known kelch13 mutations (wild-type, C580Y, R539T, I543T, Y493H) which were tested blindly in the same batches (each 96-well) with the test samples. Isolates with mixed alleles were considered as mutant. Following WHO recommendations, kelch13 mutants were classified in three groups: (i) wild-type group (parasites with no synonymous or non-synonymous mutations compared to 3D7 sequence), (ii) kelch13 validated (F446I, N458Y, M476I, Y493H, R539T, I543T, P553L, R561H, C580Y) and candidate mutation (P441L, G339A, V568G, P574L, A675V) group, and (iii) other kelch13 mutants group (parasites with synonymous or non-synonymous mutations not present in the kelch13 validated and candidate resistance mutation group). Pfpm2 (PF3D7_1408000) and Pfmdr1 (PF3D7_0523000) gene copy number were measured by qPCR using a CFX96 real-time PCR machine (Bio-Rad, France), relative to the single copy of the β-tubulin gene (used as reference gene), as previously described . Amplification was carried out in triplicate. In each amplification run, six replicates using DNA from 3D7 parasite reference clone and three replicates without template (water) used as negative controls were included. Copy numbers were calculated using the formula: copy number = 2−ΔΔCt; with ΔΔCt denoting the difference between ΔCt of the unknown sample and ΔCt of the reference sample (3D7). Specificities of Pfpm2 and Pfmdr1 amplification curves were evaluated by visualizing the melt curves. Multiple copies vs single copy, of both Pfmdr1 and PfPm2, were defined as copy numbers < 1.5 and ≥ 1.5 respectively. Data were recorded and analyzed using Excel software and MedCalc (MedCalc Software, Belgium). Groups were compared using the Chi squared test or the Fisher’s exact test. All reported P-values are two-sided and were considered statistically significant if < 0.05. The P. falciparum samples collected from patients before treatment and yielding a successful result, by country and molecular assay, are presented in Table 1. Among the 68 Southeast Asian clinical isolates collected in Vietnam with available data, 67.6% (46/68) were found to harbour parasites with validated or candidate kelch13 resistance mutations (Table 2). Details regarding kelch13 mutants according to the collection sites are presented in Table 3. By contrast, none of the 332 isolates collected from African patients and successfully tested were found to carry validated or candidate kelch13 resistance mutations. Significant difference in proportion of isolates with multiple copies Pfmdr1 were found between Africa (21.1%, 64/304, 95% CI 16.2–26.9%) and Asia (6.3%, 5/79, 95% CI 2.0–14.8%, P = 0.002, Table 2). Parasites with multiple copies of Pfpm2 were observed in 11 Asian samples (13.9%, 11/79, 95% CI 6.9–24.9%) and unexpectedly at higher proportion in African isolates (26.8%, 80/298, 95% CI 21.3–33.4%, P = 0.02, Table 2). However, multiple copies of Pfpm2/single copy Pfmdr1, hypothesized to favour resistance to PPQ, were found at similar proportion in a small cohort of 10 Asian isolates (12.7%, 10/79, 95% CI 6.1–23.3%) and 47 African samples (15.8%, 47/298, 95% CI 11.6–21.0%, P = 0.72, Table 2 and Fig. 1). In Asia, seven isolates (10.8%, 7/65, 95% CI 4.3–22.2%) had genotypes associated with both artemisinin and PPQ resistance (i.e. with kelch13 validated and candidate resistance mutations, and multiple copy Pfpm2/single copy Pfmdr1) (Fig. 2a). In Africa, no clinical isolates had mutations conferring both artemisinin and PPQ resistance due to the absence of kelch13 mutant-type parasites (Fig. 2b). kelch13 validated and candidate mutations were detected in > 60% of the isolates in all sites (from 61.1% in Gai Lai to 73.0% in Binh Phuoc) except Quang Tri (where only one sample was collected) (Table 3). C580Y was the most predominant kelch13 validated and candidate mutation (54.3%, 25/46, 95% CI 25.2–80.2%) followed by P553L (37.0%, 17/46, 95% CI 21.5–59.2%), I543T (2.2%, 1/46, 95% CI 0.5–12.1%) and G568G (2.2%, 1/46, 95% CI 0.5–12.1%). In Khanh Hao, two isolates were found to have both C580Y and P553L single mutant parasites (likely from a polyclonal infection). Isolates with multiple copies of Pfpm2 were detected only in two sites located along the Cambodian border: in Gai Lai (16.7%, 3/18, 95% CI 3.4–48.7%) and in Binh Phuoc (28.6%, 8/28, 95% CI 12.3–56.3%). No parasites with multiple copies were detected out of 32 isolates in Khanh Hao. Parasites with a single copy of Pfmdr1 were frequent (> 88%) in samples collected from all four study sites (from 88.9% in Gai Lai to 100% in Quang Tri). Parasites with multiple copies Pfpm2/single copy Pfmdr1 were observed in 10/79 (12.7%, 95% CI 6.1–23.3%) of the isolates collected from Vietnamese patients, representing in Gai Lai 11.1% (2/18, 95% CI 1.4–40.1%) and in Binh Phuoc 28.6% (8/28, 95% CI 12.3–56.3%). Isolates with genotype conferring both artemisinin and PPQ resistance (i.e. with kelch13 validated and candidate mutations, and multiple copy Pfpm2/single copy Pfmdr1) were only observed in patients enrolled in Binh Phuoc (29.2%, 7/24, 95% CI 11.7–60.0%). No kelch13 validated and candidate mutations was detected at any site. Other non-synonymous mutations were observed: A578S was the most predominant kelch13 mutation (7/10; 3 in Uganda, 2 in Gabon, 1 in Mozambique and 1 in Burkina Faso) followed by Y541F, M562T and A626V (only detected once in isolates from Burkina Faso) (Table 4). Isolates from Uganda and Burkina Faso showed an unexpected high frequency of parasites with multiple copies of Pfpm2 (33.9%, 38/112, 95% CI 24.0–46.6% and 30.5%, 32/105, 95% CI 20.9–43.0%, respectively). Samples from Gabon and Mozambique had a lower frequency of multiple copies of Pfpm2 estimated at 11.3% (8/71, 95% CI 4.9–22.2%) and 12.5% (1/8, 95% CI 0.3–69.6%), respectively. Of note, in the Democratic Republic of Congo, results from two isolates were available and one isolate was found to carry parasites with multiple copies of Pfpm2. Parasites with single copy Pfmdr1 were detected in almost all isolates in patients enrolled across the six African sites, therefore, only 13/105 (12.4%, 95% CI 6.6–21.2%) isolates from Burkina Faso, 2/12 (16.7%, 95% CI 2.0–60.2%) from Mozambique, 17/72 (23.6%, 95% CI 13.8–37.8%) from Gabon and 31/113 (27.4%, 95% CI 18.6–38.9%) from Uganda had multiple copies of Pfmdr1. One out of two patients harboured parasites with multiple copies of Pfmdr1 in DRC. Parasites with multiple copies Pfpm2/single copy Pfmdr1 were observed at a frequency of 20.9% (22/105, 95% CI 13.1–31.7%) in Burkina Faso, 18.8% (21/112, 95% CI 11.6–28.7%) in Uganda, 12.5% (1/8, 95% CI 0.3–69.7%) in Mozambique and 4.3% (3/71, 95% CI 0.9–12.5%) in Gabon. However, isolates with genotype conferring both artemisinin and PPQ resistance (i.e. with kelch13 validated and candidate mutations, and multiple copy Pfpm2/single copy Pfmdr1) were not observed in patients enrolled in Africa since there were no kelch13 validated and candidate mutations. The current phase 2b clinical study of artefenomel, an ozonide showing improved pharmacokinetics properties compared to artemisinins, combined with PPQ was designed to assess the efficacy of single oral doses in patients with uncomplicated falciparum malaria in Southeast Asia (Vietnam) and Africa. In addition to the clinical outcome assessment, three molecular markers associated with drug resistance for mapping the potential risks of future treatment failures were investigated in isolates collected before treatment. The frequency of kKelch13 mutations associated with artemisinin resistance, and Pfmdr1 and Pfpm2 genes copy number were measured in available isolates collected from all clinical sites. Artemisinin resistance was confirmed to be still confined in Southeast Asia. A high proportion of kelch13 validated and candidate resistance mutations were observed as well as a new unreported one (C469P) in Vietnamese parasites and the complete absence of these mutants in African isolates. As previously reported [27, 33, 34], a low proportion of kelch13 mutations was detected in African samples and all these mutations have not been shown to be associated to artemisinin resistance . However, a higher proportion (threefold) of parasites with multiple copies of Pfmdr1, a gene encoding a drug efflux pump, was observed in African samples compared to Southeast Asian isolates. 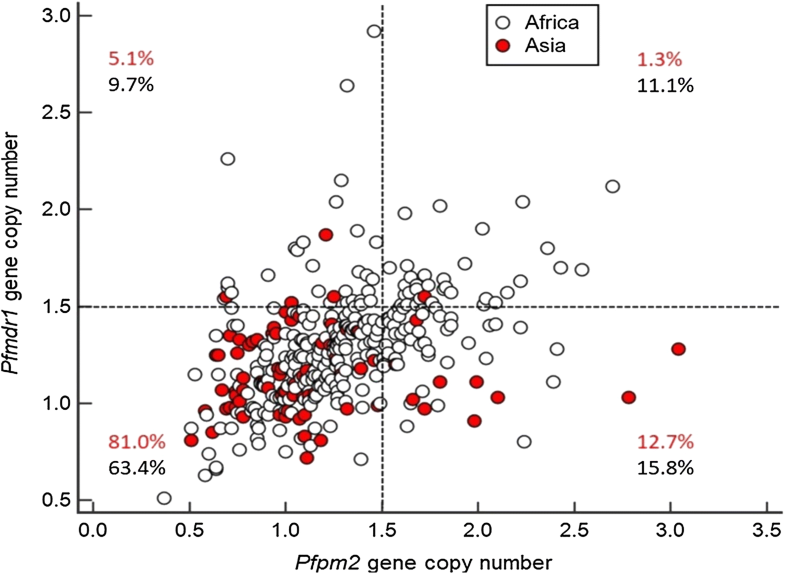 This observation contrasts with previous reports showing high frequency of parasites with multiple copies of Pfmdr1 in Asia [35, 36, 37] compared to Africa [38, 39, 40]. These finding likely reflect the profiles of evolution of P. falciparum populations linked to anti-malarial drug pressure in both continents. Especially, the prevalence of high Pfmdr1 amplification observed in Africa might be linked with the routine use of artemether–lumefantrine as first-line treatment for more than a decade. Indeed, increased pfmdr1 copy number is known to modulate parasite responses to a wide range of drugs including lumefantrine [38, 41, 42]. Supporting this expectation, it seems feasible that such parasites exposed to lumefantrine as monotherapy for several days following clearance of artemether have been selected, while parasites with a single copy have been eliminated. In contrast, the low prevalence of Pfmdr1 multiple copies observed in Southeast Asia could be due to the recent implementation of DHA–PPQ, the removal of the mefloquine drug pressure or both, as the case in Cambodia [18, 20, 43]. Resistance to piperaquine and resistance to mefloquine have been shown to be mutually exclusive in South East Asia. A possible inverse susceptibility mechanism could be at the origin of this observation. High frequency of isolates with multiple copies of the Pfpm2 has already been reported in recent studies conducted in Cambodia [18, 20, 43]. As the Vietnamese clinical sites (Gai Lai and Binh Phuoc) are located alongside the Cambodian border (Fig. 2), data from this study might reflect an evolving situation where the amplification of Pfpm2 is spreading beyond Cambodia, as described recently [5, 7]. To date, frequencies observed in Vietnamese isolates are not yet as high as the ones observed in Cambodia but might continue to increase in the future. Unexpectedly, in African isolates, amplification of Pfpm2 gene was shown to occur at a much higher frequency (~ 27% on average across clinical sites in Africa, reaching 30.5% in Burkina Faso and 33.9% in Uganda) than was recently described (from 11.1 to 13.8% in Uganda, 10% in Mali and 1.1% in Mozambique) [28, 29, 44]. 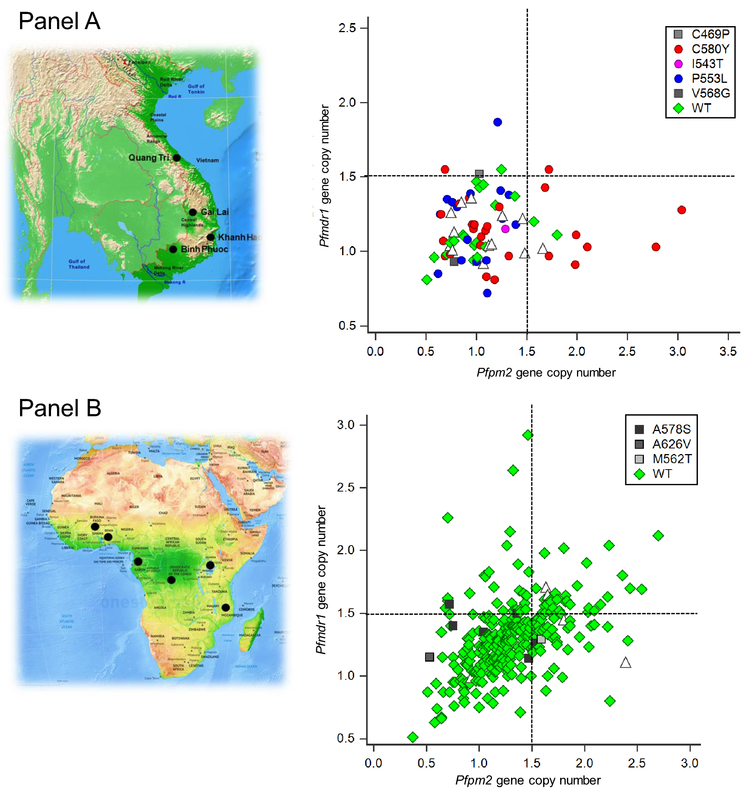 Considering the geographical extent and the diversity of the clinical sites in Africa, the high frequency reported at sites distant to each other suggests that amplification of Pfpm2 gene occurred independently in each site. More importantly, since in Southeast Asia most parasites with multiple copies of Pfpm2 also display kelch13 resistance mutations, which is not the case in African samples, it is likely that Pfpm2 amplification originated in Africa, independently of Southeast Asia. Unfortunately, in vitro or ex vivo drug susceptibility assays were not possible and association between Pfpm2 amplification and clinical resistance to PPQ was not verifiable in the current study. An evaluation is currently ongoing to see whether, and if so to what extent, these markers of artemisinin and PPQ resistance affected the parasite clearance half-life (PCT1/2) and PCR-adjusted 28 days follow-up in patients treated with artefenomel/PPQ (study MMV OZ439 13,003). However, it was recently reported that compared to drug sensitivities measured on Ugandan isolates from 2010 to 2013 (from the same site, namely Tororo), those measured in 2016 to chloroquine, amodiaquine, and PPQ were increased by 7.4, 5.2 and 2.5-fold, respectively . This longitudinal study showed that rather than drug resistance developing to these three anti-malarial drugs, an increase in sensitivity was observed that was correlated with low prevalence of the polymorphisms recently associated with resistance to artemisinins or PPQ. Indeed, clinical resistance to DHA-PPQ has not yet been reported in Africa . Although, the possibility that parasites showing amplification of Pfpm2 observed in the current study are resistant to PPQ without confirmation of in vitro or ex vivo phenotypes cannot be excluded, data reported by Rasmussen et al. suggest that significant occurrence of clinical resistance to PPQ is unlikely. In other words, in Africa it is unclear whether the amplification of Pfpm2 is necessary and/or sufficient for the development of resistance to PPQ. The ongoing analysis relating the markers of resistance to clinical outcome may provide some insights regarding this question. Until very recently, it was still debated whether additional genetic modifications in the P. falciparum chloroquine resistance transporter (Pfcrt) gene are required to confer such resistance [46, 47]. Recent genomic and biological investigations have revealed a rapid increase in the prevalence of novel Pfcrt mutations in Cambodia (H97Y, F145I, M343L, and G353V). These mutants (from culture-adapted Cambodian field isolates or Dd2 gene-edited clones) were confirmed to confer PPQ resistance as determined using the PSA0–3h [6, 48]. At present, several artemisinin-based combinations are used in Africa and Asia to treat patients with uncomplicated malaria. Artemether–lumefantrine (AL), artesunate–amodiaquine (AS–AQ), artesunate–mefloquine (AS–MQ), artesunate–sulfadoxine–pyrimethamine (AS–SP), dihydroartemisinin–piperaquine (DHA–PPQ) and pyronaridine–artesunate (PA) achieve more than 95% efficacy in clinical trials based on PCR-adjusted Day 28 ACPR. Due to the long post treatment prophylaxis of the well-tolerated PPQ, DHA–PPQ is currently under evaluation in a number of interventions, such as intermittent preventive treatment in pregnant women or in infants (IPTp, IPTi) and mass drug administration campaigns (MDA) in Africa. As a key surveillance goal, it is therefore of particular importance to continue following the evolution of Pfpm2 amplification along with mutations in the Pfcrt gene and to investigate whether these genetic signatures are associated with PPQ resistance in Africa. FM, DL, BL, RK, NK, EL and DM substantially contributed to analysis and interpretation of data. DM, RK, NK, and EL substantially contributed to acquisition of data. YA, SO, AB, GMN, JMNN, RV, YD, AKT, TTD and PBQ were responsible for the prospective collection of biological samples for this study. FM substantially contributed to conception and design. DL and DM drafted the manuscript. All authors contributed to critically reviewing of the manuscript. The authors agreed to be accountable for all aspects of the work. All authors read and approved the final manuscript. We are grateful to the patients who took part in the study and their families. We would like to thank all local investigators who have conducted the clinical studies (Alfred B Tiono, Marielle Bouyou-Akotet, Halidou Tinto, Quique Bassat, Saadou Issifou, Afizi Kibuuka, Peter G Kremsner, Alphonse Ouedraogo, Michael Ramharter) and MMV staff involved in study conduct, data collection and reporting (Helen Demarest, Stephan Duparc, Sophie Biguenet). We thank Drs. M. Adamy and T. N. Wells for their critical reading of the manuscript. MMV would also like to acknowledge their development partner Sanofi-Aventis. FM and DL are employees of Medicines for Malaria Venture. None of the other authors declare competing interests. The datasets used and/or analysed during the current study are available from the corresponding authors on reasonable request. No details relating to individual participants are presented in this manuscript. The study (MMV OZ439 13 003) conformed to the Declaration of Helsinki and Standard Operating Procedures that meet current regulatory requirements and guidelines laid down by the International Conference on Harmonization for Good Clinical Practice in Clinical Studies, and approved by the relevant Independent Ethics Committees (IEC), National Institutional Review Boards and where relevant, local regulatory authorities at each of the participating sites. Patients and parents or guardians of participants provided written informed consent prior to enrollment. Study related information was provided in the participants’ local languages. The study protocol was registered and the study results are reported on clinicaltrials.gov (NCT02083380). The study was funded by Medicines for Malaria Venture (MMV). MMV is funded by a number of donors. Unrestricted funding from a number of donors including; US Aid, Bill and Melinda Gates Foundation, UK Department for International Development, Norwegian Agency for Development Cooperation, Irish Aid, Newcrest Mining Limited, Australian Aid, Swiss Agency for Development and Co-operation and Wellcome Trust, contributed to the study. Study activities at the CERMEL, Gabon were supported financially by the Federal Ministry of Science, Research and Economy of Austria as part of the EDCTP programme. These activities at the Gabonese site are part of the EDCTP2 programme activities of Austria supported by the European Union. These funders had no role in the design, conduct or analysis of the trial.